EXPO Centre Sharjah has announced that SteelFab, a key show for metal working, metal manufacturing and fabrication, will have a new concurrent trade show – Fastener Middle East – from next year. The announcement was made by Saif Mohammed Al Midfa, CEO, Expo Centre Sharjah, on the opening day of the SteelFab 2015 exhibition. “SteelFab is now an established regional show. Over the years, we have introduced certain verticals within the show which we are now looking to develop into concurrent and standalone shows. Fasteners and stainless steel are two such segments and we are launching Fastener World Middle East alongside SteelFab next year,” said Al Midfa. Fastener World Middle East will be a dedicated trade fair for the fastener and fixing industry, and provide an opportunity for international manufacturers to demonstrate both typical and specialised fasteners to regional buyers. “SteelFab now encompasses a trade fair, a series of special focus areas, special pavilions, new segments, live displays, technical seminars and product presentations. The addition of Fastener World ME will help it cover more segments and increase its profile. We are not far away when SteelFab will be seen as the largest and the best industrial show of its kind in the region and beyond,” added Al Midfa. As a prelude to the launch, SteelFab introduced the Fasteners Pavilion at the 2015 edition. The special focus areas at SteelFab include welding and cutting, materials handling, machine tools and pipe and tube machinery as well as live displays, technical seminars and product presentations. SteelFab 2015 was held at a time when the UAE is striving to provide a fresh momentum to economic diversification, an initiative that gives the steel fabrication and metal working industry a big boost. This year’s event was opened by Sheikh Khalid Bin Abdullah Bin Sultan Al Qassimi, chairman of Sharjah Sea Ports and Customs. Present was Abdullah bin Mohammed Al Owais, chairman, Sharjah Chamber of Commerce and Industry. 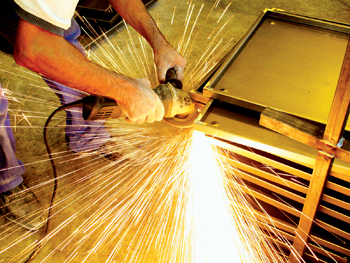 With demand for fabrication machinery and equipment on the rise in the region, industry experts say that gaining insights into the right use of equipment has become a crucial component in delivering exceptional metal products. Foreign participation is a strong point of SteelFab and this year too the show saw a surge in the number of exhibitors. The Italian participation grew to over 35 exhibitors and the German pavilion featured 22 companies with other German manufacturers participating directly or with their regional distributors. The Taiwan pavilion expanded to 16 exhibitors. There was a notable increase in the number of participants from Turkey, India and China. SteelFab 2015 featured almost 350 direct exhibitors who represented nearly 900 brands from across the world at all the six halls of Expo Centre. The technical seminars looked into topics such as blast process optimisation and operating cost analysis, software applications for steel fabrication and automation in structural steel fabrication. Top executives and industry experts discussed at the technical seminars the use of the latest fabrication techniques and new trends and advancements in machining, welding and cutting and robotics. “The seminars held alongside SteelFab 2015 complemented the ‘touch and feel’ experience of the show with an opportunity for in-depth understanding and analysis of the latest technology and products,” said Al Midfa, A variety of topics were taken up by experts in the field, which made the event important for the regional steel fabrication and metal working industry, he added. CNC cutting techniques have come a long way over the past five years and seminars on dual-cutting (plasma and oxy fuel and plasma and waterjet) by Koike and Soitaab illustrated the point. “These days, there is hardly any facet of manufacturing that is not touched by the automated CNC machining centre. Engineers and operators will have to plan efficiently to produce higher accuracy on modern CNC equipment,” said Al Midfa. Laser cutting has progressed in leaps and bounds and the laser machines displayed at the show by world leaders such as Amada, Trumpf and Bystronic were complemented by a seminar on laser cutting consumables courtesy of Thermacut – Abicor Binzel. Of interest to the oil and gas contractors were seminars on machining by Doosan, large pipes by Somo and the future of heavy sub-arc welding by Esab. By presenting new trends and machining solutions, Passtech helped participants grab the next big opportunity in the field of oil and gas equipment. Other seminars on blasting and steel fabrication by industry leaders such as Kaltenbach, Empire Abrasives and Zeman were further augmented by topics on pipe construction and solutions for scaffolding. Equinox stressed on the importance of accuracy and automation, shot blasting and painting technology for scaffolding manufacturing, while Qsteel provided glimpses into wear (abrasion) resistance and high-tensile steel plates. Kaltenback took participants through practical, profitable and powerful solutions for surface treatment, and Lion International threw light on cost reduction that can be achieved by using new MIG welding technology. OKI Bering introduced its new Mathey Dearman CNC saddle machines, which offer utmost durability and accuracy with digital motion control and a simple operator interface thus making cutting complex pipe intersections fast, accurate and easy. Others including Tyrolit, Kadana, Magnatech, Esab, Arwani, Abicor, 3M, Thermacut, Celada, Core Dynamics and Lincoln Electric presented seminars in their respective fields of expertise.